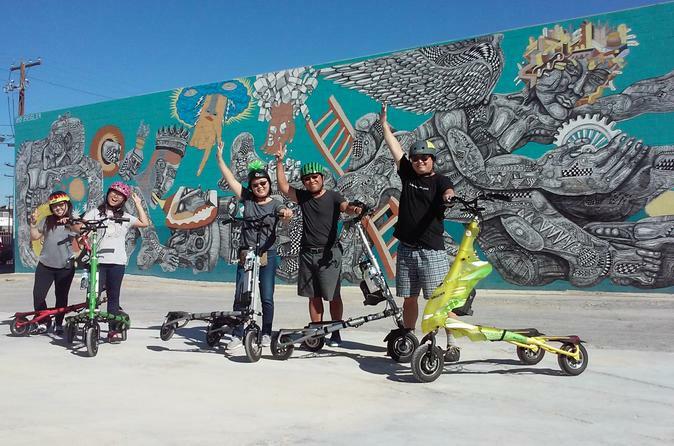 Carve your way through downtown Las Vegas’ best outdoor art on a 1-hour Trikke tour of the city’s Life is Beautiful installations with an experienced guide. Learn to ride your standing, 3-wheeled scooter, then follow a route past stunning murals that have added vivid color to Las Vegas. Get the inside story on the artists’ gorgeous creations and the annual Life is Beautiful art, music and food festival. Meet your guide in downtown Las Vegas, and start your 1-hour tour by learning the basics of steering, propelling and stopping your trikke—the cambering scooter is a fun, active way to move around the city, and you’ll be moving fluidly by the time you start your tour. Explore downtown via the city’s stunning public artwork, taking in murals created by an international who’s-who of street artists that includes Zio Ziegler, D*Face, Bicicleta Sem Freio, Jerry Misko II, Borondo and Doze Green. Hear the stories behind each mural and artist on a personal listening device so you can catch every word. Find some of the most iconic murals that have been created during the annual ‘Life is Beautiful’ music festival, then get beyond the headliners to see hidden gems by up and coming, lesser-known artists. Finish your tour in downtown Las Vegas, close to the city’s best restaurants, bars and attractions.